Early last month we were in Miami for Art Basel, one of the most exciting happenings in the art world. Since 1970, Art Basel’s goal has been to connect the world’s premier galleries and their patrons, and serve as a meeting point for the international art world. 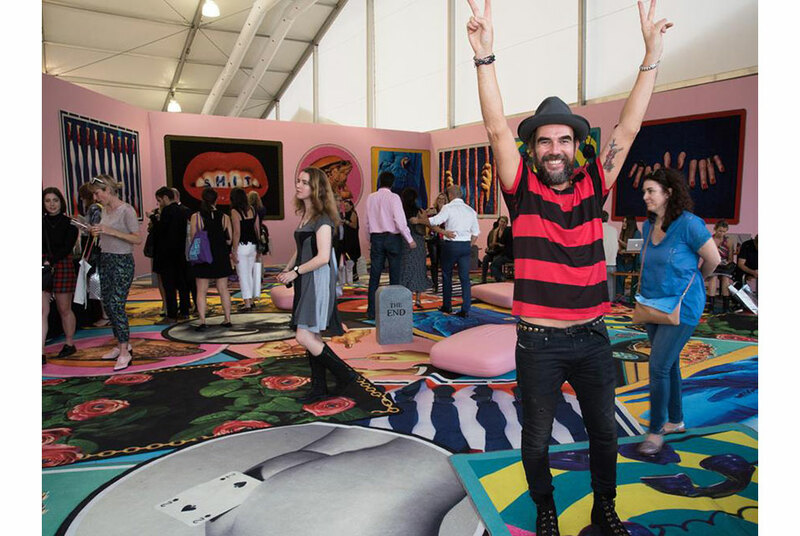 Not only do leading contemporary galleries convene in Miami, but so do countless directors, curators, and influencers from various museums and cultural institutions. From fine art to large-scale public artworks, film, performance, and graffiti all become a part of the Miami landscape. During our time in Miami, we made sure to visit several museums between the art fairs and gallery tours, including the Perez Art Museum, Frost Art Museum, MOCA, ICA Miami, and Vizcaya Museum and Gardens. We particularly enjoyed exploring the grounds of Vizcaya after dark during an evening reception. Aside from the gorgeous gardens and architecture, we were wowed by the performance art that evening. A projected audio/visual piece portraying the mansion’s original architecture drawings, broken glass and letters between Vizcaya’s original owner and mastermind, James Deering, and his architect, builders and craftspeople. Check out the clip to see for yourself! At Cuseum we’re all about making art and museums accessible and available to everyone, so naturally we were overjoyed by the public art across Miami Beach as well as the many conversations surrounding the topic of making art accessible to all. Miami’s public art scene is top notch and takes a form all of its own during Art Basel. Collins Park and SoundScape Park are hotspots for large-scale outdoor sculpture and murals flank the sides of skyscrapers in Miami Beach and warehouses across Wynwood. For the third year, the fair’s Public Sector is curated by Nicholas Baume, Director and Chief Curator of the Public Art Fund. Baume brought together artists from 11 countries to create 27 site-specific artworks and installations for the outdoor show, which transformed Collins Park into a massive sculpture park filled with large-scale installations, kinetic artworks and an array of performances. “It’s there for everybody that has the time and inclination to check it out,” Nicholas Baume on public art in Collins Park as part of Art Basel Miami Beach. Another public art event that really stood out to us on this trip was the Visionaire 65 FREE Public Art Installation in partnership with Stella Artoisa at Faena Hotel Miami Beach, which offered artwork by famous artists to the public for free! Yes, that’s right… free art for all! Visionaire, an art publication, offered its issue for free in the form of artwork from 12 distinguished artists for this installation. The artists, including Marilyn Minter, David Salle, and Glenn Brown, are some of the most renowned and sought-after names in the art world. They generously contributed highly-covetable artwork to the issue in order to give back to the Miami community and art lovers from all over. One of our most inspiring takeaways was from the panel discussion on “Education in the Contemporary Art Museum” with Heidi Reitmaier (MCA Chicago), Jason Yoon (Queens Museum), Pablo Helguera (Museum of Modern Art), and Joanne Lefrak (SITE Santa Fe) at the UNTITLED Art Fair in Miami Beach. How can museums invite audiences to be a part of the process? What’s the point of being if people can’t cite your museum’s relevancy in their experience? How do you open up and design opportunities for different kinds of audiences to work together to create a space which they own - in terms of their passion and love of art? Museum educators and those creating technology for museums are in a unique position to help create thoughtful learning experiences for visitors! At Cuseum, we engage museum goers in new ways to help them develop a deeper connection with their museum experience. Our mobile guides not only guide visitors through a space, but also allow them to interact with and comment on works that they find most interesting. This is very much in line with “shared authority” - a current trend in the museum space. Heidi Reitmaier from MCA Chicago emphasized how this concept embraces that “the multiple perspectives of people who come and experience the art is equally as valuable as the institutional perspective.” We couldn’t agree more, Heidi! Listen to the entire panel discussion online here for more insightful tidbits about education in the contemporary art museum. This discussion and the many incredible artworks, fairs, and, of course people, we encountered in Miami left us inspired for what’s to come in 2016! Big thanks to everyone who took the time to meet with us and show us around!